Negroponte was born to Dimitri John [el] (Greek: Νεγροπόντης), a Greek shipping magnate and alpine skier, and grew up in New York City's Upper East Side. He is the younger brother of John Negroponte, former United States Deputy Secretary of State. Another brother Michael Negroponte is an Emmy Award-winning filmmaker, and his other brother, George Negroponte, is an artist and was President of the Drawing Center from 2002 to 2007. He attended Buckley School in New York, Fay School in Massachusetts, Le Rosey in Switzerland, and The Choate School (now Choate Rosemary Hall) in Wallingford, Connecticut, from which he graduated in 1961. Subsequently, he studied at MIT as both an undergraduate and graduate student in Architecture where his research focused on issues of computer-aided design. He earned a master's degree in architecture from MIT in 1966. Despite his accomplished academic career, Negroponte has spoken publicly about his dyslexia and his difficulty reading. Negroponte joined the faculty of MIT in 1966. For several years thereafter he divided his teaching time between MIT and several visiting professorships at Yale, Michigan and the University of California, Berkeley. In 1967, Negroponte founded MIT's Architecture Machine Group, a combination lab and think tank which studied new approaches to human-computer interaction. In 1985, Negroponte created the MIT Media Lab with Jerome B. Wiesner. As director, he developed the lab into the pre-eminent computer science laboratory for new media and a high-tech playground for investigating the human-computer interface. Negroponte also became a proponent of intelligent agents and personalized electronic newspapers, for which he popularized the term the Daily Me. In 1992, Negroponte became involved in the creation of Wired Magazine as the first investor. From 1993 to 1998, he contributed a monthly column to the magazine in which he reiterated a basic theme: "Move bits, not atoms." Negroponte expanded many of the ideas from his Wired columns into a bestselling book Being Digital (1995), which made famous his forecasts on how the interactive world, the entertainment world and the information world would eventually merge. Being Digital was a bestseller and was translated into some twenty languages. Negroponte is a digital optimist who believed that computers would make life better for everyone. However, critics such as Cass Sunstein have criticised his techno-utopian ideas for failing to consider the historical, political and cultural realities with which new technologies should be viewed. In the 1980s Negroponte predicted that wired technologies such as telephones would become unwired by using airwaves instead of wires or fiber optics, and that unwired technologies such as televisions would become wired—a prediction commonly referred to as the Negroponte switch. In 2000, Negroponte stepped down as director of the Media Lab as Walter Bender took over as Executive Director. However, Negroponte retained the role of laboratory chairman. When Frank Moss was appointed director of the lab in 2006, Negroponte stepped down as lab chairman to focus more fully on his work with One Laptop Per Child (OLPC) although he retains his appointment as professor at MIT. Mary Lou Jepsen, Alan Kay and Nicholas Negroponte unveil the $100 laptop in November 2005. In November 2005, at the World Summit on the Information Society held in Tunis, Negroponte unveiled the concept of a $100 laptop computer, The Children's Machine, designed for students in the developing world. The price has increased to US$180, however. The project is part of a broader program by One Laptop Per Child, a non-profit organisation started by Negroponte and other Media Lab faculty, to extend Internet access in developing countries. Negroponte is an active angel investor and has invested in over 30 startup companies over the last 30 years, including Zagats, Wired, Ambient Devices, Skype and Velti. He has sat on several boards, including Motorola (listed on the New York Stock Exchange) and Velti (listed on the NASDAQ and formerly on the London Stock Exchange ). He is also on the advisory board of TTI/Vanguard. In August 2007, he was appointed to a five-member special committee with the objective of assuring the continued journalistic and editorial integrity and independence of the Wall Street Journal and other Dow Jones & Company publications and services. The committee was formed as part of the merger of Dow Jones with News Corporation. Negroponte's fellow founding committee members are Louis Boccardi, Thomas Bray, Jack Fuller, and the late former Congresswoman Jennifer Dunn. Negroponte has influenced modern day futurists, such as David Houle. ^ "Q & A with Nicholas Negroponte". C-SPAN. November 25, 2007. Retrieved November 30, 2014. ^ Negroponte, Nicholas (1970). The Architecture Machine: Towards a More Human Environment. Cambridge, Massachusetts: MIT Press. ISBN 0-262-64010-4. ^ Schrage, Michael (October 7, 1985). "An MIT Lab Tinkers With the Future of Personal Computers". The Washington Post. p. 13. ^ Negroponte, Nicholas (1991). "Products and Services for Computer Networks". Scientific American. 265 (3): 76–83. ISSN 0036-8733. ^ Negroponte, Nicholas (1999). Being Digital. New York: Knopf. ISBN 0-679-76290-6. ^ Speaking at a Northern Telecom meeting in the mid-80s with George Gilder. Negroponte called it "trading places" Gilder called it "The Negroponte Switch". From Being Digital, 1995, Negroponte, N. ISBN 0-340-64930-5 p 24. ^ Kirkpatrick, David (November 28, 2005). "I'd Like to Teach the World to Type". Fortune. Retrieved 12 December 2010. ^ "Velti Announces Date of AIM Delisting". Archived from the original on March 5, 2012. Retrieved August 27, 2012. ^ Wall Street Journal, August 1, 2007. "Text of Dow Jones Editorial Agreement". Online edition. Retrieved October 21, 2007. 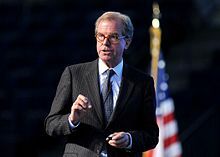 Wikimedia Commons has media related to Nicholas Negroponte. "Nicholas Negroponte collected news and commentary". The New York Times.